On the Tool Palette, double click on Console Application. An editor window will appear. (See the Delphi 7 section for how to start a console application using the file menu). 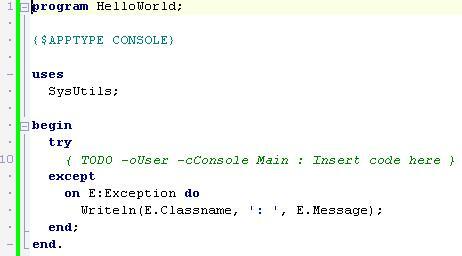 On file menu, click on Save and save the program in a suitable folder as HelloWorld.dproj. 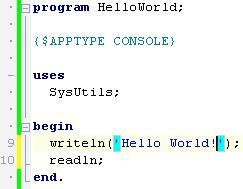 Delete the lines between begin and end then type the lines writeln('Hello World! '); followed by readln; in their place.